The modern office got its start in New York City in 1915, when a local insurance company transitioned to the low-profile desks and open floor plans that are trending again 100 years later. From Wall Street to Silicon Alley, New York City is a global business center for companies in all sectors and stages of development. Brand new start-ups and Fortune 500 companies are taking advantage of the new construction and historical spaces the city has to offer, teaming with renowned architects to create workspaces that will push business forward. The architects on this list are realizing ideal offices for industry leaders and earning national recognition for their work. In the spirit of a startup, Float Studio let budget restrictions work in their favor for Casper, the disruptive mattress company that offers a one-size-fits-all model. In their two-floor, 34k-square-foot office in the Flatiron district, exposed ceilings and original brickwork cut costs and add character. The main level, designed to evoke a morning aura, is bright and airy, suffused by natural light. A hollow, white-tiled partition between reception and a communal area defines the space and allows light to pass through. It also serves as a drop-down projector screen for company-wide presentations. The second story has a sleepy, nighttime quality, underscored by bed alcoves where employees can hold casual meetings or just take a nap. A grass terrace overlooking Midtown is host to outdoor meetings and lunches. For Superfly, the company behind Bonnaroo and other music festivals, Float Studio created a 20k-square-foot space that makes an inspirational backdrop for the highly creative team. Exposed ceilings and unfinished columns lend themselves to the bohemian aesthetic popularized by the Superfly’s festivals. Booths, living room settings, conference rooms with blackboard walls, and upholstered, wall nooks create a range of spaces for staffers to come up with the next big idea in live music. Brad Zizmor and Dag Folger, founding principals of A+I, are both alumni of the Graduate School of Architecture at Columbia University. Over the last 20 years, their firm has grown into a team of more than 70 multidisciplinary designers, who take an investigative approach to designing offices, retail shops, and developments throughout the city. A+I, which stands for “architecture plus information,” has been featured in the Interior Design Best of Office issue, and the magazine inducted Zizmor and Fogler into their Hall of Fame for designers who are thought leaders in the industry. Women’s Wear Daily and The New York Times have also profiled A+I designs. A+I designed a 100k-square-foot headquarters for Squarespace. The firm ran a three-month employee strategy study to arrive at the best design. Today, the young internet company occupies three full floors and a roof deck at the Maltz building in SoHo. Sophisticated and welcoming, the library and panorama bar offer flexible workspaces. In keeping with the client’s restrained aesthetic, A+I utilized concrete floors and workstations and wood cladding to create depth with texture rather than color. Warm walnut and leather seating add warmth. Tumblr, another darling of the digital age, expanded from its single-floor home to a multi-story headquarters with help from A+I. Each of the varied conference rooms is named for an iconic, New York building. The ground-floor venue was previously a nightclub, and the roof deck is yoga-ready. Like the platform itself, Tumblr headquarters responds to fluid and of-the-moment digital culture. Every wall features Tumblr artwork, and employees can use the GIF booth to generate more. Founder and hands-on Principal Jeffrey Inaba established his own firm in 2006, after graduating with distinction from Harvard’s graduate architecture program, he and a previous role heading up AMO. He is also the Founding Director of C-LAB, a Columbia University think-tank exploring emerging relationships between architectural design and technology. Darien Williams, AIA, who at one time worked for the firm as a designer, later returned to the company as a principal. In the interim, she worked with the New York Office for Metropolitan Architecture an Ai Weiwei’s Beijing design firm. Inaba Williams has drawn the attention of Metropolis Magazine and Architectural Record. Red Bull Music Academy commissioned a four-floor office design by Inaba. The firm transformed a vacant space in Chelsea into 38k square feet designed for music production, broadcasting, workshops, and performances. Each space is delineated by curved walls, creating pods that lend privacy and acoustic buffer without creating isolated workspaces. The firm earned awards from the International Association of Lighting Designers Award and GE Edison Lighting for dramatic use of light throughout. The design also took home an American Institute of Architects (AIA) New York Merit Award, a Core 77 Design Merit Award, and an Architizer A+ Workspace Jury Award. In another project for the same umbrella corporation, Inaba designed the Red Bull New York office. Rather than relying on graphics and decor to give the 16.8-square-foot space personality, rooms of varied size and lighting are purposefully flexible and minimal to fit any employee’s purpose at the time. Inaba earned an AIA New York Design Merit Award and an Architizer A+ Workspace Jury Award for an office design that accounts for employees bringing life to the space. The team at Design Republic Partners Architects has specialized in office, retail, and media design for over 20 years. In that time, they have worked with more than 200 clients, including ABC, Accenture, Barclays Capital, HBO, and Ferrari. When designing a workspace, Partners Neil Tucker, AIA, LEED AP, Barry Ludlow, AIA, LEED AP, and Design Manager Inga Kruliene, LEED AP, lead the team and the client through a series of discovery exercises to ensure that the resulting design reflects the character and goals of the company that will call it home. Business Insider, The Real Deal, and The New York Post have taken notice of the firm’s work. Yelp is a $3B business that has changed how we use the internet. When it came time for new digs in New York, they partnered with Design Republic Partners Architects to match that spirit with an innovative design. Yelp has more than 4,000 employees around the world, so the two-floor, sales-oriented, New York office needed a strong, localized identity. Small meetings are held in open spaces, like a common area styled like a miniaturized High Line park. Each of the four teams is settled in a “neighborhood” named for one of the distinct communities throughout the five boroughs. Russian vodka brand Stolichnaya tapped Design Republic Partners Architects to design their US headquarters. The firm aimed to blend the brand’s Russian history with American flavor. The result is cool and elegant space with concrete floors, black painted glass, and architectural plaster accents. Staffers have room to breathe in adapted cubicles delineated by floating gray volumes. The red accents throughout nod at the brand’s signature color. The Stoli office wouldn’t be complete without a bar. Theirs is wood-paneled, topped with limestone, and set under moody lighting. The backsplash is a grid display sized perfectly for their bottles. HLW International is an ENR Top 500 Design Firm and among the Top 225 Firms in the world. The design firm has its roots in New York City. Its earliest architecture subsidiary got started in 1885, when Alexander Graham Bell commissioned the first Manhattan telephone building. At this stage, the firm was also working on iconic office buildings like The New York Times building, which gave Times Square its moniker. Thought leaders in workspace design, HLW International has landed on the Building Design + Construction list of the Top 100 Office Architecture Firms. The YouTube Space NY and Google BrandLab designed by HLW International earned a 2015 NY Design Awards Gold Winner. The 20k-square-foot office above Manhattan’s Chelsea Market offers resources for content creators and emergent brands. The cutting-edge facilities include recording studios, green-screen stages, editing bays, and wardrobe areas. Meeting areas encourage creators to collaborate on projects and share ideas, especially the workshop space, with its sculptural take on a campfire at its center. In the spirit of collaboration and transparency, HLW designed a space with extended sightlines, glass-walled breakout rooms, and a floor plan that encourages movement through the space. For the main Google office at Chelsea Market, HLW designed a 70k-square-foot addition to accommodate a staff increase at the East coast headquarters next door. The design manages to blend Google’s workplace standards and the industrial architecture of the former Nabisco factory building by aligning flexible work stations with existing columns. To address the change in floor height between the original office and the addition, HLW added a slide and a porch that overlooks the new digs. Founded in 2003, WORKac is a comprehensive architecture firm led by Dan Wood, FAIA, LEED AP, and Amale Andraos, dean of the Graduate School of Architecture at Columbia University. Both partners have an international background and degrees from esteemed universities. Their designs incorporate the strategies and motifs of urban planning and lifestyles into functional and beautiful interior spaces. An AIA New York State Firm of the Year, the firm has also been recognized by ENR and the Architectural League of New York. Architectural Record, Surface Magazine, Wall Street Journal, and New York Magazine are among the respected publications that have covered WORKac designs. Wieden+Kennedy partnered with WORKac to design a SoHo office worthy of the advertising giant and its industry-changing history. With a reputation for offices that make a mark on architecture, Wieden+Kennedy wanted to broaden that mark with their 50k square feet by subverting the playful design trends popular in today’s office spaces. The design centers contemporary, creative workflow, offering meeting space in a range of sizes and layouts; traditional conference rooms, close-quarter “phone booths,” and “picnic-table” set ups are collaborative zones for any number of team members. Glass walls and polished concrete floors allow light to pass through and reflect around the space. The design won the Interior Design Best of Year Award, ArchDaily Building of the Year, and an AIA New York Merit Interior Architecture Award. Diane von Furstenberg Studio headquarters, in the Gansevoort Historic Market District, is a six-story structure housing a store, showroom and event space, administrative offices, topped with a glass, faceted penthouse apartment. A center stairway connects each space and diffuses natural light from the perimeter through to interior offices. The adaptive reuse project drew praise from the New York Landmarks Preservation Commission and received the MASterwork Award for Best Historic Renovation from the Municipal Arts Society. In its near-40-year history, FXFowle Architects has completed featured projects. The firm has ranked among the Architect Magazine Top 50 firms in the business, sustainability, and design categories, as well as in the overall list. Not bound to any one market, FXFowle has been at the forefront of architecture for public institutions, office buildings, urban planning, and education institutions. Managing Partner Guy Geier, Fellow of the AIA (FAIA) and the International Interior Design Association (FIIDA), LEED AP, has served as president of the International Interior Design Association New York Chapter and is a sitting member of the AIA Large Firm Roundtable. With Geier’s direction, the firm has earned recognition from CODAworx, The Brick Industry Association, NYCxDesign, AIA Brooklyn-Queens, and the New York Urban Land Institute. 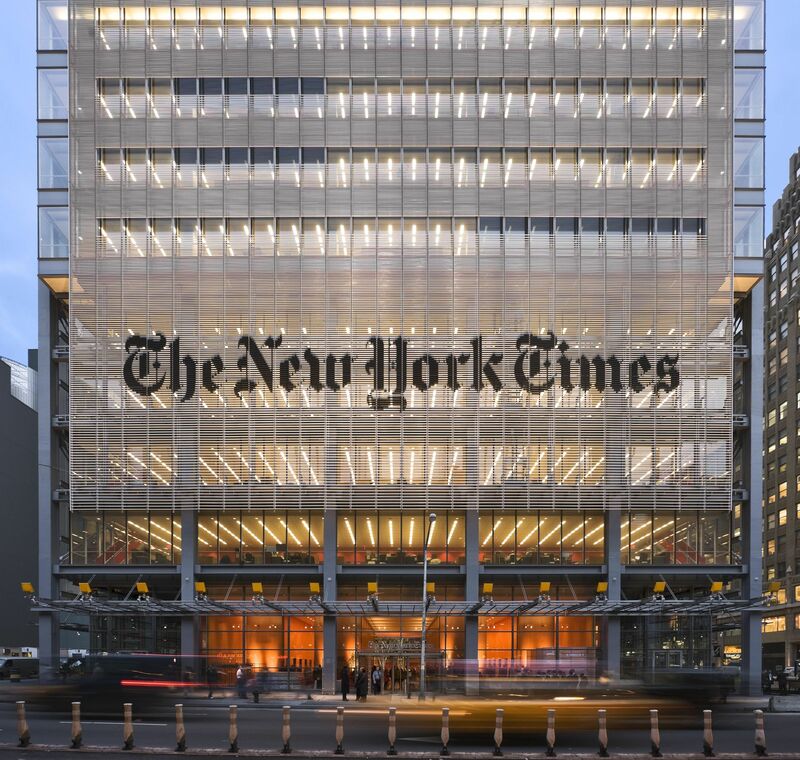 FXFowle collaborated with Renzo Piano Building Workshop on the New York Times building, new headquarters for the paper of record. The 52-story tower, on the border between the Garment District and Hell’s Kitchen, is wrapped in a double-skin curtain wall that shields employees from glaring sunlight and allows them to adjust the interior light with ultra-clear glazing and an interior blind system. From the street, the exterior white, ceramic rods, painted with “the Gray Lady’s” banner, resembles large-scale, futuristic newsprint. The building won numerous awards, including a national AIA Honor Award, Awards of Merit and Excellence from AIA New York State for commercial and sustainable design, and project of the year from New York Construction magazine. For another commercial tower, FXFowle design a 40-story building at Eleven Times Square. Spanning a full block between 41st and 42nd street, the building features a concrete core to allow for column-free corner offices, with full views of the city. A glass curtain wall is modified with custom, silk-screened panels. A BOMA/NY Pinnacle Award-winner for New Construction, the design also took home an Environmental Design _ Construction Excellence in Design Award and a Professional Design Award from the Society of American Registered Architects. Microsoft has made the building their New York City home. At Spector Group, design is a family affair. Founded in 1965 by AIA Fellow Michael Harris Spector, the architecture, interiors, and master planning firm is now in the capable hands of his sons, Scott E. Spector, AIA, and Marc B. Spector, AIA and member of the National Council of Architectural Registration Boards (NCARB). As principals, the pair and their team of designers expand Spector Group’s presence in New York City and its surroundings, building on the legacy that has grown since Scott founded the regional office in 1998. Now one of Crain’s top 25 Largest New York Architecture firms, Spector Group has completed north of 1,000 projects and earned numerous national and local AIA awards for their work, which touches every inch of the five boroughs. When Quirky relocated its headquarters from NoHo to the Garment District, the social product company worked with Spector to design a space that leverages the original architecture of their new home: the Terminal Stores Building. The new office features refurbished, wide-plank wood floors from the 1875 building. Exposed brick and concrete, skylights, and an open floor plan lend an edgier, more modern aesthetic. Sitting pretty on the top floor of the former rail delivery hub, Quirky can take advantage of a 1,500-square-foot roof deck with panoramic views of the city. Also in the Terminal Stores Building, Spector designed a 55k-square-foot headquarters for ride-sharing and technology company Uber. Utilizing a similar aesthetic to bridge contemporary workflow with the building’s old-school charms, Spector organized individual workstations and breakout areas along a unifying channel. In the game rooms, fitness areas, and town hall space, team members meet to talk business and socialize. Architectural Record, The New York Times, and Variety.com have all praised the work of Studios Architecture, a 30-year-old practice with a stellar list of clients. Chairman of the Board Thomas Yee joined Studios Architecture in 1985, the year the company opened for business. Now an international practice, Studios Architecture’s regional offices are led by 20 principals, though they emphasize lateral collaboration throughout the design process. In 1995, the firm opened their New York office in a 19th-century, commercial SoHo building. Studios Architecture’s corporate designs have earned Gold Nugget Awards, AIA regional chapter honors, and recognition from Chicago Athenaeum and IIDA. New York Business Journal covered the Union Square office Studios Architecture designed for Dropbox. The cloud storage leader now occupies 12k square feet across one floor of a landmarked building. A completely open floor plan, glass front meeting rooms, and casual seating areas encourage collaboration. Charcoal columns form an organizing spine down the center of the office, with distinct areas for reception, and a cafe and pantry alongside. Original, exposed brick walls, wood panel floors, and window frames were restored or adapted to complement the redesign. Bricked-over windows became framed whiteboards surrounded by casual meetings. Architectural Record covered Studios Architecture’s design for a five-floor office space for Dow Jones and The Wall Street Journal. The financial publishing company consolidated all of its service groups to this 240k-square-foot location in Midtown, and the design needed to facilitate centralizing and flattening the organization. The reception area siphons employees and their guests into the café and meeting areas. It overlooks the main hub, where three groups of editors can exchange information received through a multi-screen, LCD display around the hub’s perimeter. Despite flashy accoutrements like screens lined down a hall displaying the latest from the Dow Jones websites, the sustainable design also employs green finishes, efficient lighting, and a reflected ceiling plan. AIA New York gave Studios Architecture a Merit Award in Interior Architecture for the design. The ENR #1 Green Building Design Firm in Commercial Offices and the Building Design + Construction Giants #1 Office Sector Architecture Firm, Gensler also rises to the top of both publication’s overall lists. The firm maintains that strong workspace design can enhance the performance of a company and its staff. With 46 worldwide offices of their own, and a client list that includes 40 of the top 50 companies on the Fortune 500 list, Gensler has had many opportunities to test that theory. Regional Managing Principals Robin Klehr Avia, FIIDA, and Joseph Brancato, AIA, have led office projects for Microsoft, Condé Nast and Young & Rubicam. Etsy’s 200k-square-foot headquarters in DUMBO took three years to go from broad concept to the largest Living Building Challenge (LBC) Petal-Certified building in New York City. To meet one of the most stringent sets of sustainability standards, Gensler designed a state-of-the-art, nine-floor campus with open collaborative spaces, secluded “quiet labs,” and an outdoor courtyard and rooftop for al fresco meetings and lunch breaks. The office, with its communal kitchens, craft workshop, and digital lab, earned ENR New York Best Green Project and an Excellence award from the Center for Active Design. In the Hudson Yards Development emerging out of Manhattan’s Far West Side, a new commercial tower houses L’Oréal Hudson Yards, the French beauty giant’s US headquarters. L’Oréal’s many divisions, including 30 staple salon and drugstore brands, occupy ten stories with 360-degree views of the skyline. The historic company aimed at an aesthetic and functionality usually reserved for technology start-ups. The 418K-square-foot office has informal seating areas for conferences, a beauty lab for product testing, Amenities for employees include a full-floor cafe, a cosmetics store, and nail salon.